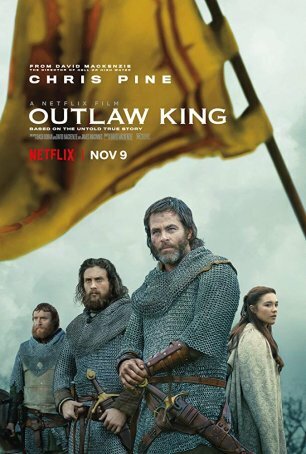 Outlaw King, a lavish period piece fronted by Chris Pine and Stephen Dillane, could be seen as a follow-up to Mel Gibson’s Oscar-winning Braveheart, although this new production lacks the epic greatness that infused the earlier film. Picking up shortly after Braveheart’s conclusion with the execution of William Wallace, Outlaw King tells “the rest of the story,” so to speak. Wallace’s death didn’t kill the passion for Scottish independence and this movie puts some speculative flesh on the bare bones of history to show the next steps in the contentious process. The movie follows the character of Robert Bruce (Chris Pine) who initially bends the knee to King Edward I (Stephen Dillane) at the behest of his father (James Cosmo). Once the old man is dead, however, Robert comes to regret the decision and he is soon in open rebellion against the Crown, accepting the title of Robert I, King of the Scots. His wife, Elizabeth (Florence Pugh), emerges from the shadows to stand beside him and various nobles, including James Douglas (Aaron Taylor-Johnson), whose title was stripped from his family by Edward, and Angus Og Macdonald (Tony Curran), join his cause. Predictably, the king doesn’t take well to this uprising and sends his son, Edward (Billy Howle), to put it down by any means necessary. Director and co-writer David Mackenzie (who previously worked with Pine in his previous feature, Hell or High Water) stays within the framework of established history although, as one might expect for events that transpired 700 years ago, there are significant gaps. These provide Mackenzie with opportunities to spice things up and make them cinematic. He focuses on the relationship between Robert and Elizabeth, lending a touch of romance to the proceedings. The battles, especially the climactic one, are effectively staged and, even for those with an understanding of what happened, there are elements of excitement and suspense. The movie doesn’t come with a lot of star power. Chris Pine is the biggest name in a cast of character actors and, although his role as Captain James T. Kirk Mark II has catapulted him to the A-list, the only other recognizable names are Aaron Taylor-Johnson and Stephen Dillane. Dillane’s interpretation of Edward I recalls his portrayal of Stannis Baratheon in Game of Thrones, making one wonder whether the actor has become typecast. For me, the surprise standout is Florence Pugh, the fresh-faced British actress who previously had the lead role in 2016’s Lady Macbeth. She makes the most – and more – out of a limited role and shows strong chemistry with the somewhat dour Pine. Period recreation is where Outlaw King shines. This movie looks and feels like it used a time capsule. The roads are muddy, the castles are lived-in, and life is a combination of drudgery, hard work, and drunkenness. The movie was shot on location in Scotland and that greatly enhances its verisimilitude. Although the film’s scope and emotional impact don’t come close to that of Braveheart, it’s as solid as one could expect from a period piece focused on a lost era with a hero that some might brand a terrorist. Netflix will premiere the film for streaming beginning November 9. The final cut differs from the one shown at the Toronto Film Festival in that Mackenzie has “tightened up” the narrative by removing about 20 minutes from the running time. Continuity and pace are fine – the edits don’t create a choppy feel. With the exception of a few slow spots, Outlaw King flows briskly. It’s one of the better “Netflix originals” the service has provided and worth the expense of two hours.